Lately I’ve been picking up a lot of modern made, yet vintage themed, gaming systems, and since they have vintage video games on them I feel the need to review them and let the readers know what some of our beloved vintage video games are up to these days. 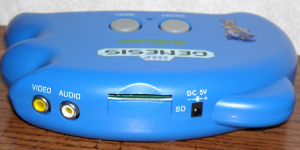 The newest system I’ve bought is something called the AtGames Sega Genesis Arcade Motion that I picked up at the thrift store, this is a system I was aware of yet never really gave much thought to, based heavily on the fact that it looks like one of the many Nintendo Wii clones with junk games packed in. What set this one apart from the crowd was that is says Sega Genesis across the top, is shaped like Sonic the Hedgehog and even has a Sonic sticker on the actual system, so I figured I had to give it a test. 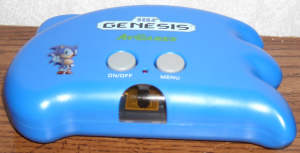 AtGames Genesis Clone with controller. At first I had my doubts about this system and all that it claimed to do, the wireless controllers were merely infrared LEDs with a gaping eyesore of a receiver on the front of the system. Infrared wireless is great if you need to change the channel or volume on your TV, but given the fast pace of most video games you’re often left lacking in speed and accuracy. Another issue arose when I read “40 games, 110 plus levels of play.”, being familiar with Famicom pirate cartridge tactics I was suspect as to how many actual games there were, and how many levels they were split into to get those numbers. Putting aside the infrared trying to be passed off as wireless and the very familiar over inflation of how many games actually were packed in, one feature piqued my interest above all else which was the SD card slot on the top of the system. This meant that I could slap in a SD card and add games to the already abysmal number that was packed in. I could add every production Genesis game, I could add homebrews, I could do anything! Or so I originally thought.. and hoped! But before I get too deep into the SD card function, let me give you a once over of the system itself. I was surprised by how solid the system and controller both were, they didn’t use the normal cheap plastic, perhaps it has lead in it for rigidity, go China! And the infrared, I was quietly bashing in my head, is quite good actually, given that the controller has 5 LEDs shooting out the signal, making it almost impossible to accidentally cover up and block the signal entirely, as well as giving the controller a surprisingly long range of distance. 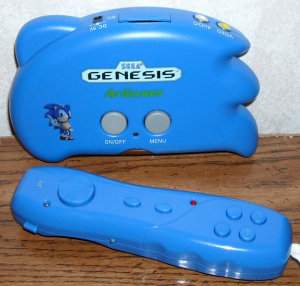 The Genesis games built in are actually all pretty good games, including: Alex Kidd in Enchanted Castle, Arrow Flash, Bonanza Brothers, Columns III, Columns, Crack Down, Dr. Robotnik’s Mean Bean Machine, Ecco the Dolphin, Flicky, Fatal Labyrinth, Ristar, Sonic Spinball, Sonic the Hedgehog, Sonic the Hedgehog 2 and The Ooze. But they also tried to pack in their own arcade brews and games to utilize the controller’s motion, both of which are pretty lacking in all aspects, especially the motion sensing games which hardly respond, if at all by accident. 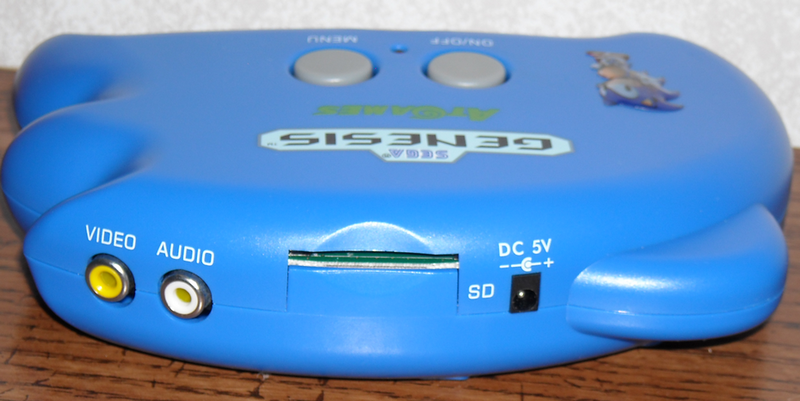 The system and controllers can both be run off batteries, or the system has the option for a 5v adapter, which I didn’t get, but we all know how systems running on batteries can be temperamental at times. But now we get into the major downside of the Genesis Arcade Motion, firstly and mostly this system is emulation and that means it is rife with all the problems emulation brings, such as: poor sound quality, some video game effects don’t work properly, squished game text, some video games are not compatible at all (Virtua Racing) and the fact that some ROMs may not work at all, by which I mean you may need to try many different versions of the same ROM to find one that works. One plus side is that this system is seemingly region free, as I’ve tested various Japanese and PAL ROMs and they have worked as well as can be expected. But given that this is a Genesis emulator you may also have the delusions I had that the system will work with other ROMs and the fact here is no, it will NOT work with 32x, Sega CD or even SMS ROMs. So with this system you are limited to Genesis and Mega Drive ROMs which isn’t so bad, until you realize the system will not create a save file on the SD card for games that require a save. This system is, however, really well suited for games that are password saves or even good old arcade classics such as Golden Axe or Street Fighter. Given it’s limitations the SD card expansion is still a pretty neat idea to open up a much bigger library than one might have hoped. I have the Sega Genesis Arcade Motion Dual, but I’ve read that there is a deluxe version with even more games packed inside. Overall the system isn’t something I would choose to play over my actual Genesis, its more of a novelty for when I’m bored and want access to games I can’t find or don’t yet own. So many good RPGs on the Genesis I will never get to play because this system can’t make a simple save file, what a shame.